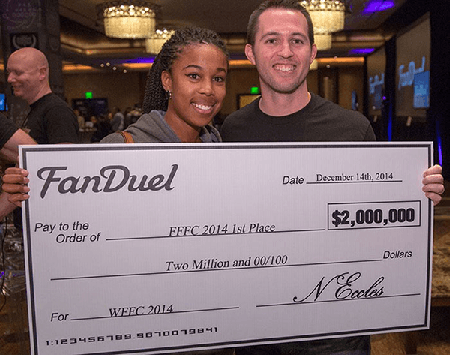 FanDuel is one of the biggest, if not the biggest daily fantasy sports (DFS) site in the industry. Based out of New York, USA, FanDuel had paid out $560 Million in 2014, and paid out over $2 Billion in 2015. FanDuel also claims to have over a million paying users, which further proves the continued popularity and growth of FanDuel. National Football League (NFL), Major League Baseball (MLB), National Basketball Association (NBA), and National Hockey League (NHL). 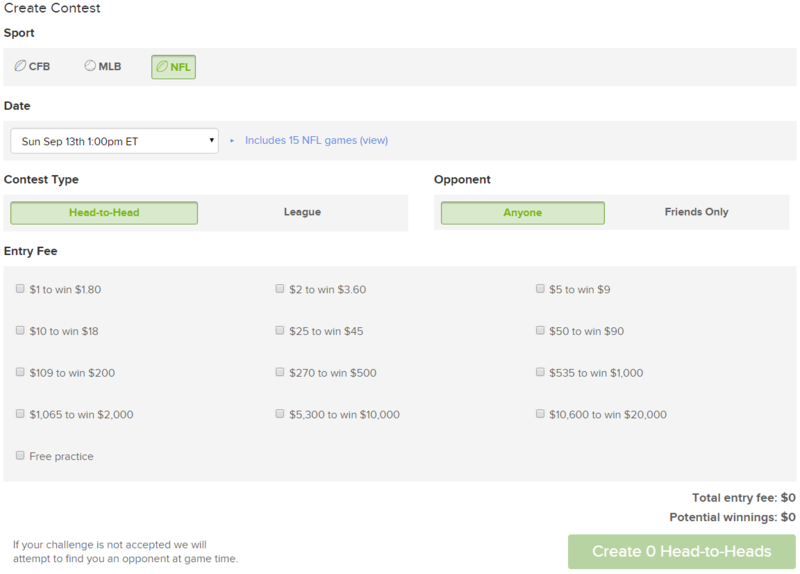 FanDuel offers a wide selection of contest types that will cover any particular need or style of a DFS gamer. FanDuel contest types are explained below. Entry fees for any contest in any sport starts at $1 with increasing fee amounts into the thousands. So whatever bankroll any DFS player has in mind for the season, the entry fee amounts, amount of contests, and contest types are easily covered by FanDuel. Signing up is simple, just click here to visit the FanDuel website. Fill in your name, email, password, and screen name. Choose your screen name carefully as this cannot be changed once you register. Click the “Join Now” button and your FanDuel account has been created! Now that you have created your FanDuel account, you have the option to deposit cash into your account. Cash deposits can be made using either PayPal or credit cards (Visa, MasterCard, and Discover). You must be at least 18-21 years old (depending on state) and a legal resident of the United States or Canada to play in cash contests. For a current list of FanDuel blocked states, click here. You are allowed a single account on FanDuel. 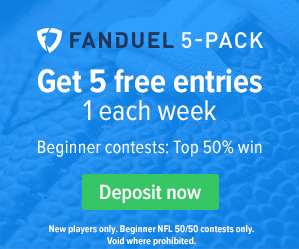 Click here to learn more about FanDuel. 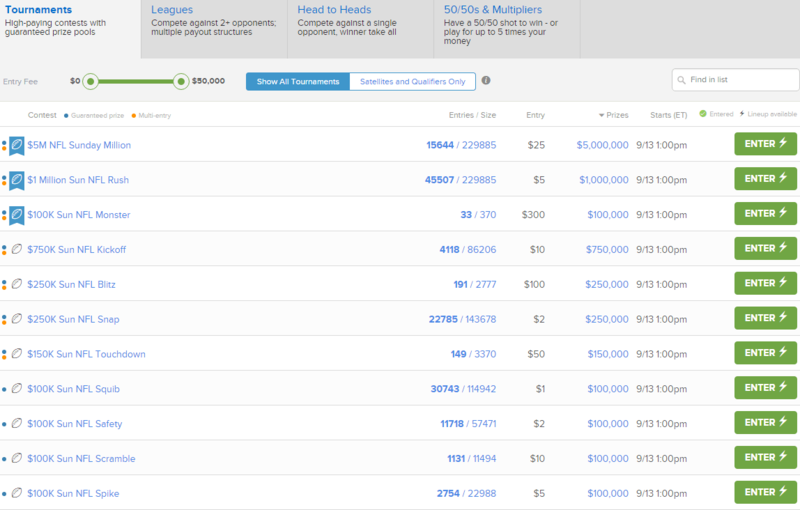 FanDuel’s main lobby is the central point of accessing whatever you may need to do. From here, you can access your account by clicking on you username in the upper right-hand corner. You can make deposits or withdrawals here. The “Help” section for customer support issues can also be accessed from the lobby. Your contest history, upcoming and live contests can quickly be accessed here as well. The scores of live contests are updated in near real-time. You can select your available sport in season, and also select the contest type for your sport. You can also filter the entry fee amounts to narrow down the list of available contests to enter. 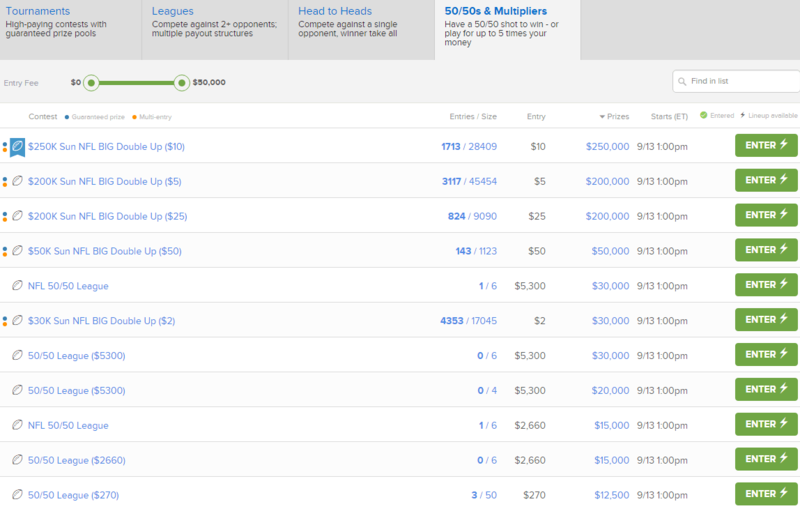 FanDuel uses a salary cap amount of $60,000 from which to create your lineups. The total cost of your lineup cannot surpass $60,000. All positions/roster spots must be filled to create your lineup. The FanDuel draft page will show the average fantasy points per game (FPPG) for each player, how many games a player has participated in, the upcoming game matchup, and the player’s salary cost. By clicking on a player, you can view information about that player including current news and game log history. You can also download all available players for a contest to a .csv file for further analysis. Once your lineup is complete, click “Enter” and you are in play! If you want to make changes to your lineup, you can edit them as long as the first player’s game has not yet started. Depending on how long it will take you to create a lineup, you can always just take a few seconds to create any lineup, then enter it, and then go back to edit it at your leisure. This way the contest you want to enter does not fill up before you finished creating your lineup. If you want to use an existing lineup in a different contest, you can import it into that contest and then enter it. You can create your own contests as well from the lobby. This simple process involves selecting your desired sport, the date/start time, the type of contest, who your opponent can be limited to, and the entry fee amount. Tournaments are high-paying contests with guaranteed prize pools (GPP). These GPP tournaments guarantees the cash prize payout structure will be paid out, whether or not the contests gets filled. These tournaments are the most popular as these have the largest cash prize payouts with the largest player entry sizes. League contests have you competing against at least 2+ other opponents with varying payout structures, depending on the entry field size. League contests are not guaranteed unless the contest completely fills. If these contests do not fill up, they are cancelled. These contests are simply you against a single opponent with the winner taking all (less the rake). 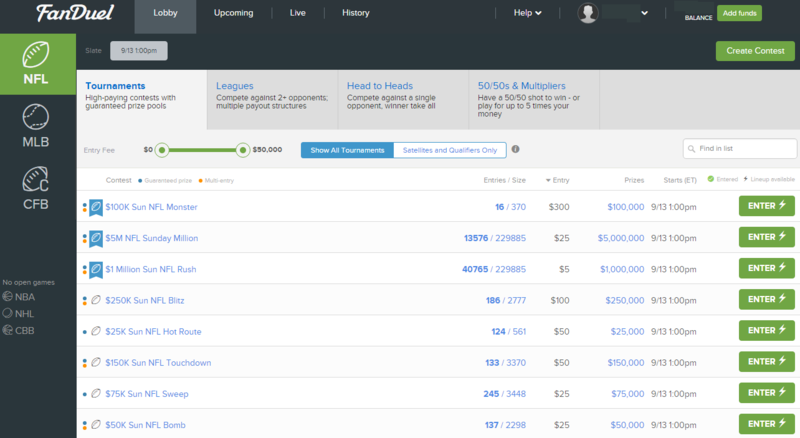 FanDuel has a 10% rake for most contests and contest types. The rake may be less for very high stakes contests at FanDuel’s discretion however. 50/50 contests pay out the winners double their entry fee (less rake) if they score in the top 50% of all contestants. It does not matter what your final score is, as long as it is in the top 50%. Multipliers are contests where the winners can win 3X, 4X, 5X, 10X, etc. their entry fee amounts. The higher the multiplier, the higher you will need to place in these contests. Satellites and qualifiers are contests that reward the winners with seats into larger upcoming tournaments. Once a seat is won, you will automatically be entered into that particular contest. Basically, winning a seat is your free entry fee into said contest. Before entering a contest, you can view the list of usernames in the contest. By clicking on a particular username, you can see their paid wins history by sport. This feature is very handy, especially if entering H2H or contests with a small entry size. This is a good way to avoid sharks, unless you want to test yourself against one. Making withdrawals from FanDuel is as simple as it gets. FanDuel pays out players either by PayPal or by check. You may need to submit your social security number (SSN) before a withdrawal is processed. FanDuel will require this information in the event that your annual net winnings exceed $600, which requires a 1099-Misc tax form filing. 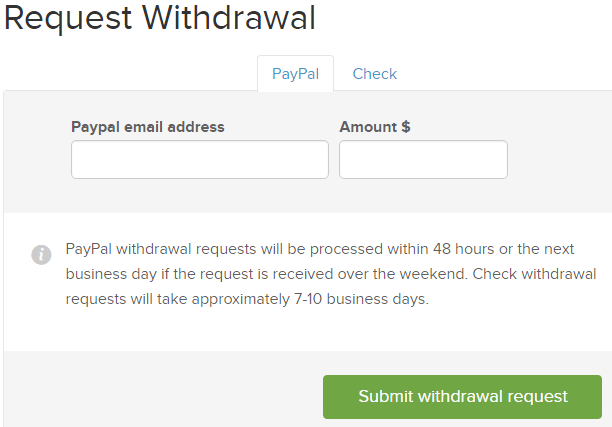 Click on your username in the upper right-hand corner to access withdrawals. Check out our FanDuel App and Mobile Site review here. Click on the Help link next to your username, then click “Support”. 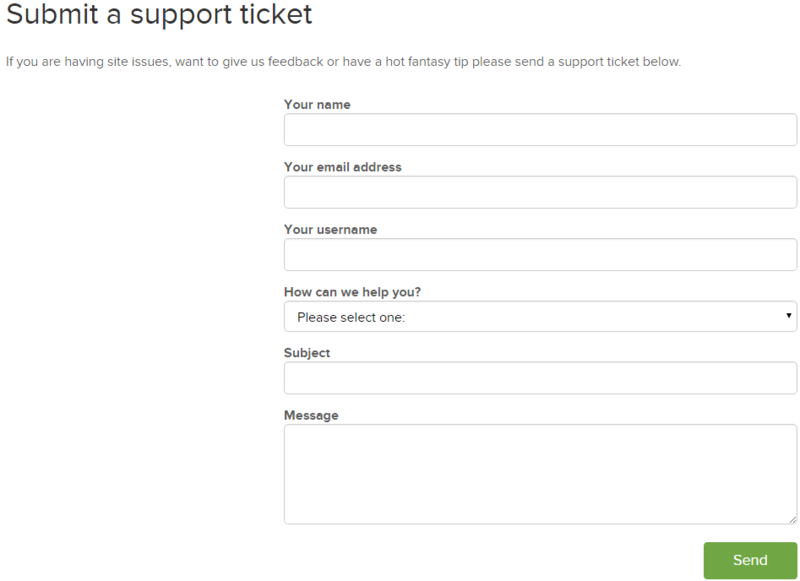 FanDuel provides three options for customer support. 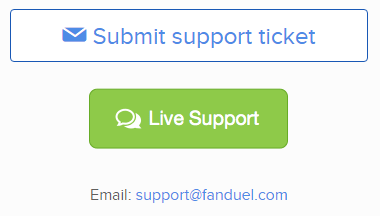 You can submit a support ticket, enter a support live chat, or send an email to support@fanduel.com. If sending an email, be sure to use the email address on account with them and your username. If you reside in the UK, be sure to check out sportsbetpromocodes.co.uk for free sports bets! Is FanDuel legit? Read the FanDuel review at Legit or Scam! You can read more about the FanDuel TV promo code at Fantasy Footballer. Share your FanDuel experiences and submit your own review!